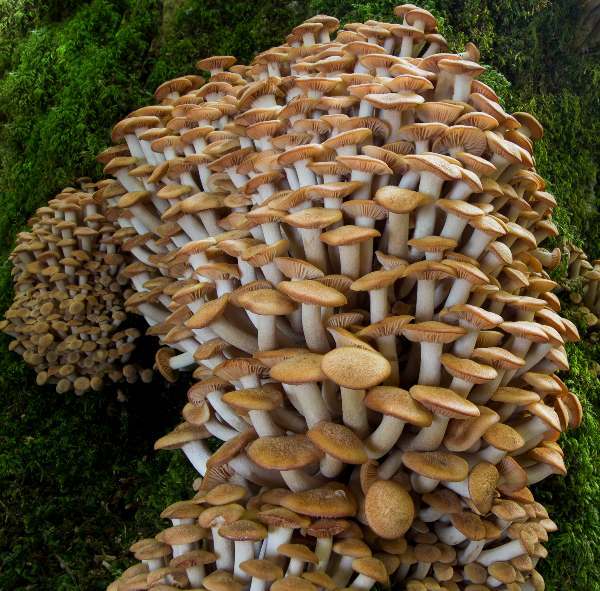 There are many forms of Honey Fungus or Honey Mushrooms as some call them, and in the past they all shared the scientific name Armillaria mellea. Nowadays it is generally accepted that there are several distinct species, one of which, Armillaria tabescens, does not have a stem ring. 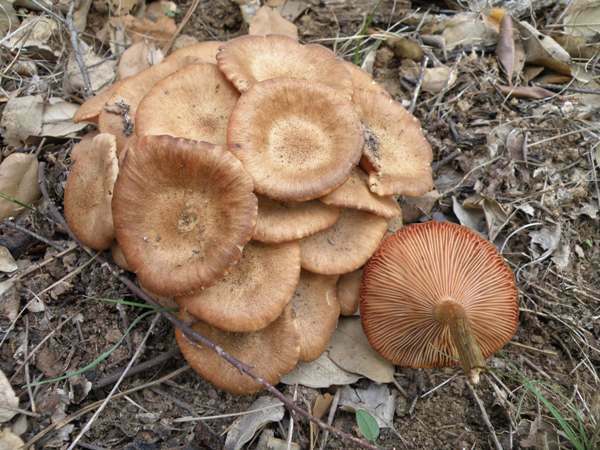 Armillaria tabescens is on average a little smaller and usually darker than Armillaria mellea. Like Armillaria mellea, this parasitic fungus occurs on broad-leaf trees, and oaks in particular. 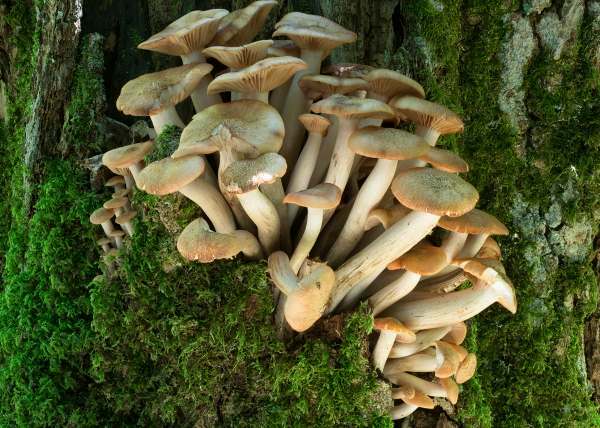 Uncommon and rather localised in the south of Britain and Ireland, the Ringless Honey Fungus occurs widely throughout central and southern mainland Europe but is a rare find or not known to occur in some northern countries. This species is also recorded from parts of North America, where it is commonly referred to as the Ringless Honey Mushroom. This species was described in 1772 by Joannes Antonius Scopoli (1723 - 1788), who named it Agaricus tabescens. (In those days most gilled fungi were initially placed in a giant Agaricus genus, now redistributed to many other genera.) 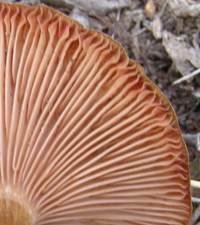 Ringless Honey Fungus was moved into its present genus in 1921 by the French mycologist Louis Emel (dates unknown). 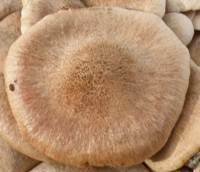 Synonyms of Armillaria tabescens include Agaricus tabescens Scop., Lentinus caespitosus Berk., Pleurotus caespitosus (Berk.) Sacc., Clitocybe tabescens (Scop.) Bres., Armillaria mellea var. tabescens (Scop.) Rea & Ramsb., and Armillariella tabescens (Scop.) Singer. The specific epithet tabescens means 'wasting away' - probably a reference to the rapid collapse of the fruitbodies of this warm-climate species. 4 to 8cm in diameter; colour ranging from ochre-brown to red-brown, usually with a darker area towards the centre. The cap flesh is white and firm. Initially deeply convex with inrolled margins, the caps flatten and often become centrally depressed with slightly wavy, striated margins. Fine dark scales cover the young caps, often creating a zoned effect, most noticeably towards the centre. The adnate or weakly decurrent gills are crowded and initially pale flesh coloured, gradually becoming pinkish-brown at maturity. 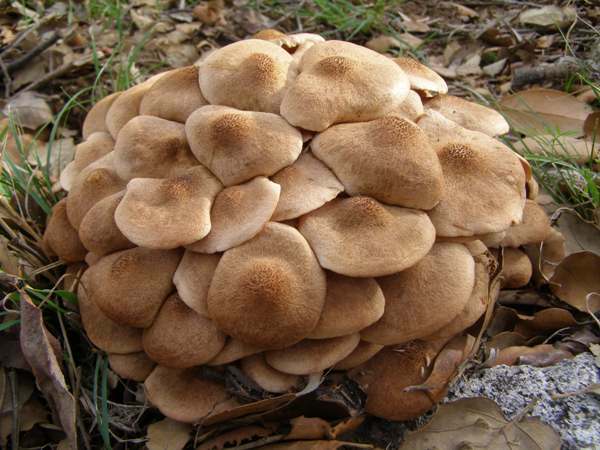 5 to 14mm in diameter and 5 to 14cm tall; tapering at base where several stems are fused together (caespitose). The stem flesh is whitish and there is no ring. Ellipsoidal, smooth, 8-10 x 5-7µm; amyloid. Astringent odour and bitter taste. Parasitic and/or saprobic on the roots and occasionally the lower trunk area of broad-leaf trees, most commonly oak trees (including evergreen as well as deciduous oaks). June to November in Britain and Ireland; several weeks later in southern Europe. Armillaria mellea, commonly referred to as Honey Fungus, is larger and paler but otherwise quite similar; however, it has a stem ring. Pholiota squarrosa is generally similar in colour and covered in scales; it retains an in-rolled margin, the gills turn uniformly rusty-brown, and it has a radish-like smell and taste.